My friend M is pregnant and has so far had to endure horrible extreme morning sickness and its really taken its toll on her. She arrived into the 2nd trimester and the sickness had finally subsided only for her to be diagnosed with SPD (sounds like something gross right? Wrong! Now get your mind out of the gutter). So having gotten out of the sickness woods she's now in the pond of pain instead. Being the wonderful, caring, sharing sort of gal' I am (and modest, totally totally modest) I suggested I came over to her house for our girls to have a play date and for me to let her put her feet up for a couple of hours and of course bring some baked goodies. So since I keep telling everyone that I'm more than happy to take requests, having seen the posts on making Lemon Meringue Pie she asked if I could make her a Lemon Meringue Pie. I said I'd see what I could do. This did not fit with my whole "new recipes" concept. Like I've said before, I'm not a huge fan of Lemon Meringue Pie. I am, however, a fan of cupcakes and I'm aware I've not made any cupcakes yet for the blog (or even in the last few years). I got to thinking. Why not make a filled cupcake and use the meringue topping as the "icing"? Yes, I know. Not exactly controversial and certainly not new judging by my google recipe trawl, but given I haven't tried making cupcakes in a while it was certainly a bit of a gamble. I am no good at gambling. I get too excited if I start winning and then start placing stupid bets. Like over Christmas. We rented a house in Mystic, CT (absolutely gorgeous - I'd certainly recommend!) for a little reunion with a couple of my hubby's old college buddies and our respective broods and drank, gossipped and played poker once the kiddos were all tucked up in bed. The second night I, the rookie loud mouth, somehow pulled a full house out of my **** and took most of the chips. 20 mins later I had somehow lost all my chips and was peeved I hadn't pulled another amazing hand out of the ether since I was now clearly the greatest poker player on Earth. Anyway, massive digression. Point is this time my gamble paid off. 1. Preheat the oven to 200C or gas mark 6 and place 12 cupcake cases in the holes of a 12-hole cupcake pan. 3. Sift the flour into a mixing bowl and stir in the sugar. Make a well in the middle of the sugar/flour mix. 4. In separate bowl add the whole egg, egg yolk and a pinch of salt and beat together. Then stir in the milk, vanilla and melted butter (I note that the recipe I used as my base said "add milk" but didn't actually say how much milk to add. After having a momentary melt-down I had a quick trawl on the net and came to the conclusion of adding a 1/2 cup which I list above in the ingredients). 5. Pour the egg mixture into the well in the flour mixture and mix on a low speed until well combined. 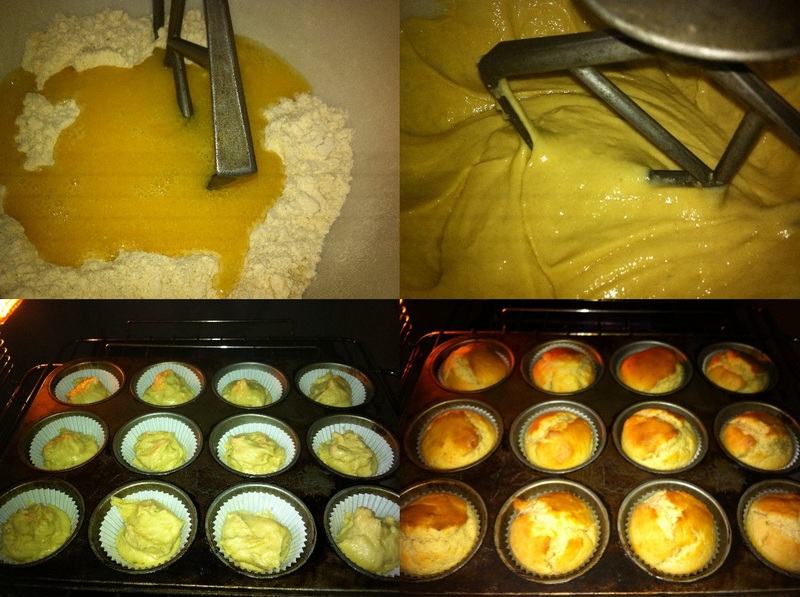 Divide the mixture into the cases and bake for 15 minutes. Yes I admit it. I betrayed Berta and used Mummy-Dearest's dinosaur-yet-still-brilliant-30-year-old Kenwood. 6. 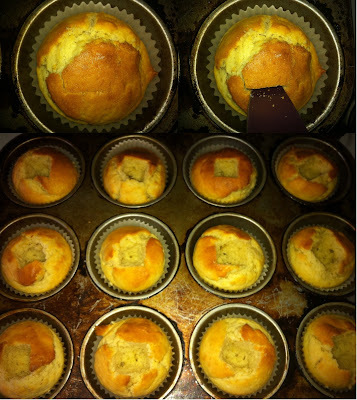 Remove the cupcakes from the oven (but leave the oven on) and let the cupcakes cool for a few minutes. Do not take them out of the tray though! Using a small sharp knife (like a pairing knife) cut a hole out of the middle of each cupcake - about an inch deep (there is no further use for the cuttings so by all means have a bit of snackage action). 7. 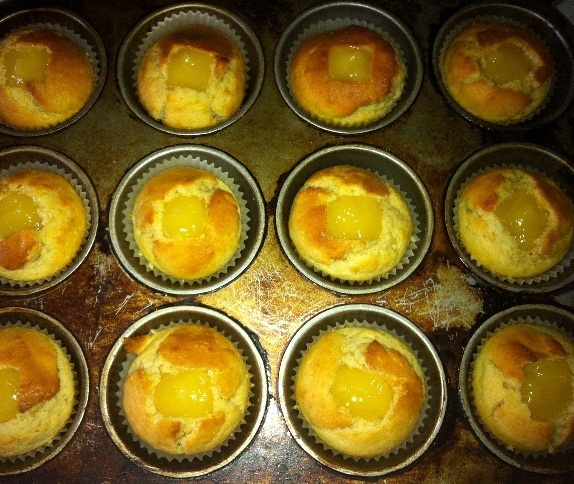 Using a teaspoon fill each hole with the lemon curd. 8. (Having obviously washed out the mixing bowl for the mixer - be careful to make sure the soap is all washed out of the bowl and the bowl is dry as these can affect the meringue) Using the whisk adaptor for the mixer, beat the egg whites until they are light and frothy. Gradually add the sugar, whisking well after each addition until the mixture is stiff and glossy. 9. Spoon the egg whites into a piping bag and using a fairly wide nozzle carefully pipe the egg white in a spiral, starting at the edge and ending in the centre with a nice peak. 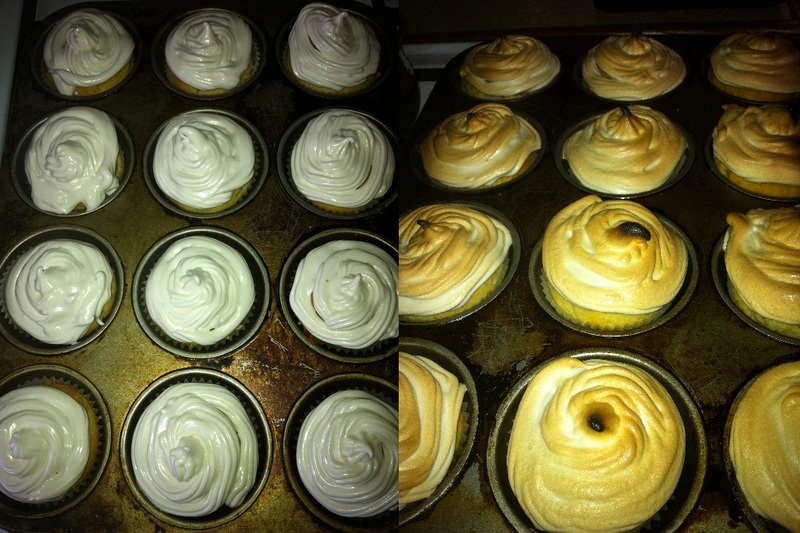 Put the cupcakes back in the oven for 5 minutes, until the meringue is golden. Ok, I've not used a piping bag in a couple of years so forgive me for not being "perfect"! These are super yummy, especially fresh from the oven. The cupcakes are really tasty and light - given Posie's usual cake-aversion she managed to get her hands on the "holes" and ate them all! As bad as it may sound I was so happy she enjoyed them I didn't mind (plus she was helped out by Grandad). They went very quickly and I only had 2 left to take into the office. I felt rather miserly but at the same time I'm always eager to get external opinions on what I've baked so figured I'd let them duke it out over the last 2. YES! I was waiting for these :-) Can I get a request in too? To totally spoil your 'new recipe thing' again I want these!! Or maybe you've just spurred me on to make them myself because I LOVE LMP! And I was TOTALLY so surprised to hear about your poker player personality - I thought you would be an EVIL poker player... or are you bluffing mwahahaaa! I promise, next time you visit I will make them just for you. Or maybe I'll do a big cake version....these are so much better than LMP. Totally totally yummers. I think a few years ago I was probably a more evil poker player...now I seem to have developed ADD!